When a non-wine drinker recommends me a bottle, I always view it with a bit of skepticism. It’s only natural — they don’t even necessarily know what wine they like let alone what wine I like. 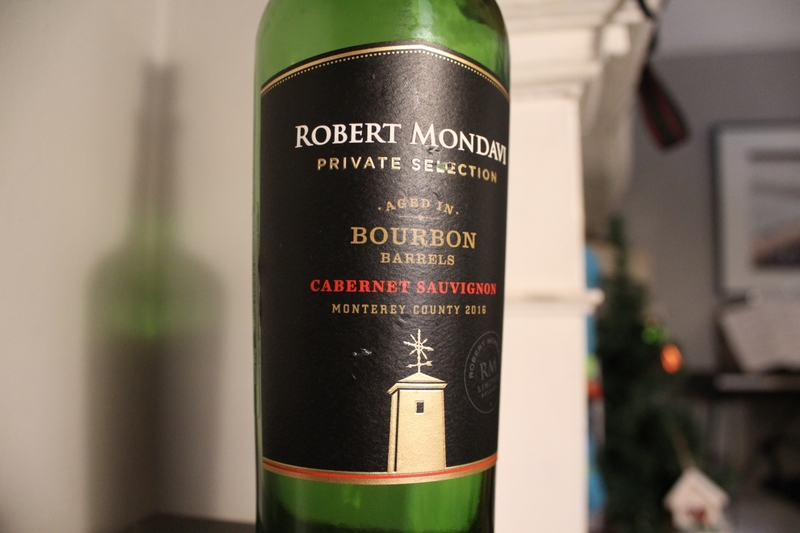 So when my buddy recommended me Robert Mondavi Private Selection Bourbon Barrel Cabernet Sauvignon on the basis that I liked wine AND bourbon, I approached with a bit of trepidation. In all honesty, I’m a bit hit and miss with Robert Mondavi wines. The high-end bottles (that I rarely have the opportunity to drink) are generally great, but the entry-level offerings can be a bit spotty. I wasn’t sure how this one would land. But as they say, “high risk, high reward” and in this case, this Mondavi Private Selection was a wonderful wine, and absolutely perfect for winter months. I actually have an established penchant for bourbon/wine crossovers. I absolutely loved the Woodford Reserve Sonoma-Cutrer bourbon aged in Pinot Noir barrels, even though reviews were generally mixed. So perhaps this review will reflect that bias, but I generally believe this is a winning wine, and a crowd pleaser at that. The wine pours a deep ruby, with a lovely clarity. A quick swirl reveals this is a more viscous wine (which I can dig) and the legs fall slowly. On the nose, the bourbon influence is immediately evident, with a rich sweetness and a tang of caramel. The wines own fruit is potent with black berry, dark chocolate and a kiss of tobacco smoke wafting up. If you’re a fan of tannic-bomb Cab Sauvs, you might be a bit disappointed. This Mondavi Private Selection is all sweet and velvet, without a ton of the mouth-puckering dryness some Cali Cabs are known for. It’s vanilla and bourbon influence creep in slowly and steadily behind the dark cherries and chocolate. The smoke on the nose is less evident on the tongue, but there’s a lovely earthiness and leather in the base notes. The finish is extremely long and sweet, with bourbon taking center stage. This rich, sweet Cab is sure to impress less-experienced wine drinkers as it is to impress seasoned vets. It was a great recommendation from a friend and I’m pleased to pass it on. It kept me warm on a chilly evening and I hope as you sip it slow, it does the same.